Last week, Apple (Nasdaq: AAPL) unveiled a tri o of new phones that followed in line with its corporate strategy. That is, get buyers to pay higher prices for the phones while hopefully gobbling up more services (such as entertainment) as growth in the global smartphone market slows to a crawl. The iPhone Xs (starting at $999) updates last year’s flagship model with updated cameras and a faster A12 processor. The iPhone Xs Max is the higher-end version and has a 6.5 inch OLED screen, with pricing that starts at $1,099. And for the first time, there are 512 gigabit storage options. The third phone is Apple’s biggest bet in the sector – the iPhone Xr. Like the iPhone X, it has facial recognition and an edge-to-edge display, but is priced starting at only $749 because Apple used older LCD screen technology and aluminum instead of stainless steel. This phone is expected to be the real driver of volume for Apple with annual sales expected to be in the 100 million units range. Apple, of course, hopes this year’s line-up will be as successful as last year’s. Apple’s iPhone revenues increased 15% year on year in the nine months to June, despite unit sales of iPhones being flat over the same time period. Apple also unveiled an Apple Watch with a larger screen and a faster dual-core processor called the S4. It also has a lot more health capabilities, making it the most significant upgrade to the Watch since it first went on sale in 2015, turning it into much more of a health monitoring device. 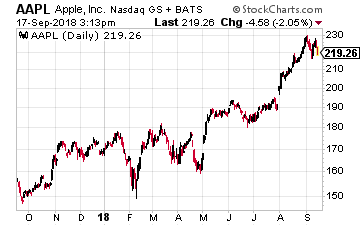 This move into health is a major emphasis for Apple, as I’ve discussed in previous articles. This new version – the Apple Watch Series 4 – has new health sensor and apps such as an ECG (electrocardiogram) monitor. Apple got clearance for the app from the Food and Drug Administration. As someone with a unique heart condition, I wonder though how many false readings the watch will produce, causing unnecessary trips to the doctor. Even though the Watch is not a runaway hot seller like the iPhone, it is the world’s best-selling smartwatch and is helping Apple expand into health, which is a plus. The new Watch line start at $399. One takeaway I had from the recent Apple event is that Apple is facing growing challenges in the smartphone market. This is particularly true if you look outside the U.S. market. More on that in an article in the not too distant future. But I also had other takeaways… and found a winner and a loser from the Apple event. 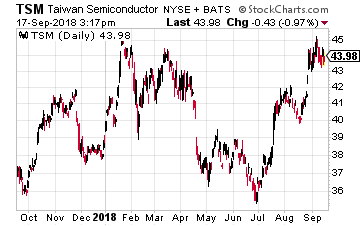 The winner has to be Taiwan Semiconductor (NYSE: TSM), also known as TSMC, which is the world’s largest contract semiconductor manufacturer with a 56% market share. And it dominates Apple’s chip production ever since Apple became Taiwan Semiconductor’s biggest client in 2015. TSMC is also at the forefront of the next phase in the evolution of the smartphone. Apple’s latest phones are the first devices anywhere to include a chip (A12 Bionic) made with 7 nanometer process technology. That means the width of the features etched on to the silicon has reached a new level of miniaturization, down from the previous 10 nanometers. The chips are designed by Apple but manufactured by TSMC. Getting to the 7 nanometer level has been much tougher for the industry than previous moves down in size, and a sign of how Moore’s Law — which predicted regular advances in the number of transistors that can be squeezed on to a chip — is running out of steam. But there is much more involved here than just size. Apple’s chip includes a specialized accelerator for machine learning known as a neural processing unit. With the promise of applications that can learn from masses of data, this is where much of the effort in new hardware design is now focused. Last month, GlobalFoundries – the world’s number two semiconductor contract manufacturer – put off its own plans for 7 nanometer chips indefinitely. And Intel, whose long leadership of the chip industry is now in question, continues to struggle. After several delays, products containing comparable chips will not be available until late next year at the earliest. This leaves TSMC in the catbird seat with production of the most advanced processors now left to just two companies – TSMC and Samsung. TSMC will be the likely the primary beneficiary as advanced technology investment grows too expensive for all but the leading industry players, as advanced technology becomes more of a ‘winner takes all’ business. By the way, GlobalFoundries’ withdrawal followed a similar move last year by United Microelectronics, the third-biggest player. 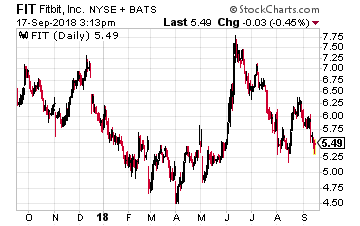 With Apple moving into the healthcare sector in such a big way with its new Watch, a likely loser is Fitbit (NYSE: FIT). On the day Apple unveiled its Watch plans, Fitibit stock fell more than 5%, bringing its loss over the past year to 16.5%. Outside, the U.S., it is facing similar competition from China’s Xiaomi, where after years of maintaining its leading position in the wearables market, Fitbit is now losing ground to the Chinese company. It seems inevitable that Fitbit’s growth will continue to slow as smartwatches outshine the fitness wearable category. Despite the broad range of devices Fitbit provides at different price points, it faces tough competition at both the high- and low-end products. At the high end, there is Apple’s multi-functional Apple Watch, which renders Fitbit devices useless. And at the lower end, the company’s biggest competitors are Xiaomi and also Garmin. Fitbit would also be affected adversely by tariffs on China since it uses China-based contract manufacturers. This will only add to the pressure on it from well-funded competitors, Apple and Xiaomi. Despite the optimism from some Wall Street firms, it is likely headed toward becoming a footnote in the history of wearable health devices, which is still in its infancy.